During our tour around Malawi and Zimbabwe we saw a good range of night birds. Fortunately we saw most of them at roost during the day thus negating the need for lengthy spotlighting sessions (which always reduced the time available for sleep). The exception was on the Kyika Plateau in Malawi where we did a couple of very successful night drives. As we journeyed up the Shire River to Liwonde NP we saw a few Water Thick-knees. A relative of the European Stone Curlew, all thick-knees or dikkops are essentially nocturnal as can be seen by their huge eyes. Another nocturnal bird seen roosting on the river banks was the rarely seen White-backed Night Heron. Again note the huge eyes. At dusk over a hundred of the much commoner Black-crowned Night Herons emerged from roost and flew along the river to feed. Although one of the world’s biggest owls, it is seldom observed and we felt privileged to get such a good view. A mere 21cm long compared to 62cm for the Pel’s, this tiny African Barred Owlet stares out from a wood near the shores of Lake Malawi. On our night drive on the Nyika Plateau we came accros this Usambara Nightjar. There are three forms in this group; Montane, Ruenzori and Usambara Nightjars are found in various montane areas of Africa. Currently Ruenzori and Usambara Nightjars are lumped and Montane split. This makes no sense to me, either all three forms should be split or they should all be lumped in to one. 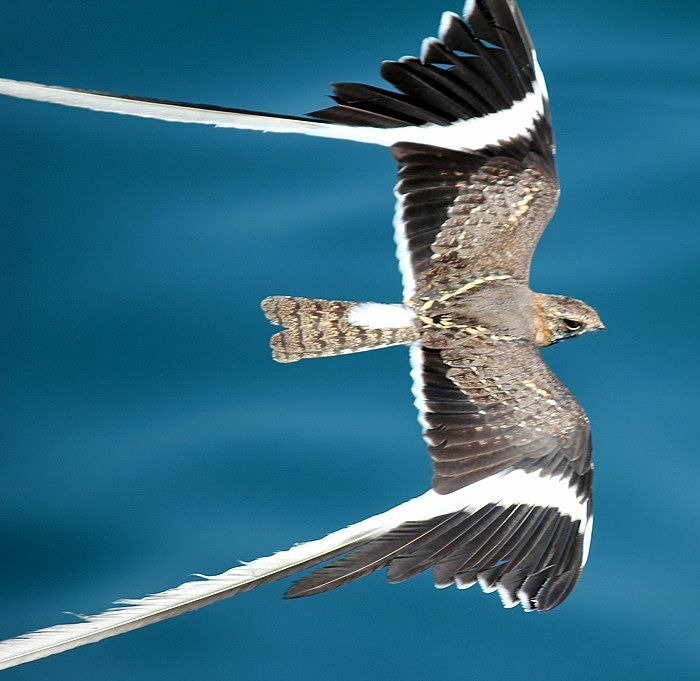 A female Pennant-winged Nightjar was tricky to identify but the unusual shape of the head was the clinching factor …. However there were no such problems in identifying a male Pennant-winged ! My friend Ewan flushed it from under foot in miombo woodland and was so surprised that his voice went all squeaky! Those are not tail streamers but massively enlarged inner primary feathers. Not without reason is this called ‘the most spectacular night bird in the world’. Eventually the Pennant-winged landed on a horizontal branch, where the true magnificence of its ‘pennants’ could be appreciated. In the Zamberi valley of Zimbabwe we came across another whopper, Verreaux’s Eagle-owl aka Giant Eagle-owl. Love the pink eye-lids. A pair of Wood Owls had taken up residence above our huts in the Zambezi valley and called all night …. They had two adorable chicks, one of which nearly fell off the branch as it twisted upside-down to see what we were doing. « Malawi and Zimbabwe – 23rd November – 12th December. I’m wondering if I can use your terrific image (https://gryllosblog.files.wordpress.com/2013/12/img_5254-wood-owl-juv.gif) for a poster at Harvard University. I’m creating a poster about learning, and your image wonderfully conveys the idea of learning as inherently confounding at times. Can we use it for this purpose free of charge with attribution to you? Why not? I’m always using other people’s photos on my blog, so its OK with me.